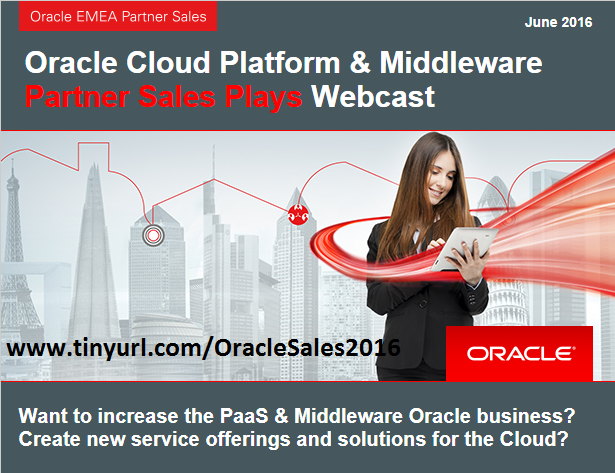 Attend our webcast on June 9th 2016 and get all the details! With cloud computing and PaaS in specific, partners become even more important. To discover new consulting opportunities we made our sales kits available for you as a partner! To get the sales kits please SOA Sales page and the BPM Sales page. To access the above links SOA Community membership is required. Want to know how to sell Oracle Hybrid Integration? Want to discover new consulting opportunities for you as a Oracle Partner? Join our SOA & BPM Partner Community Webcast June 30th 2015! 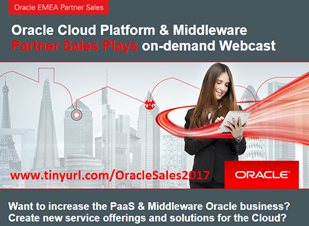 In this webcast we will give you an update on the Oracle Middleware sales plays for the Fiscal Year 2016 (just started in June). The presentation will focus on Hybrid Integration and how we can jointly create more business. Including marketing and sales offerings to increase our joint pipeline. Thrasos Thrasyvoulou will present you which Integration Solution to use in different customer use cases and how to win against the competition. The goal is to enable you to offer our joint ICS and PCS customers new cloud consulting offerings. With cloud computing Partner become even more important to ensure cloud consumption and success at our joint customers! Please join our SOA & BPM Partner Community Webcast – June 30th 2015 live at 16:00 CET. These Partner Sales Kits highlight the key middleware sales plays for SOA, BPM, AppAdvantage, and IoT for this fiscal year, FY2015. The key sales plays are intended to provide partners with an overview of the main sales opportunities to explore with their customers. Sample: Open and deploy the sample applications to complete the Oracle SOA Suite 12c Quick Start installation. Attend the OFM Summer Camps IV August 4-8th 2014 to become trained in SOA Suite 12c. Check our community calendar and your local training calendar for additional trainings. Promote your SOA Suite 12c service offerings in the solutions partner catalog. To make sure that customers can find your offerings. You are consultant and want to get an overview what is new in SOA Suite 12c? Make sure you watch our on-demand webcast with Yogesh. 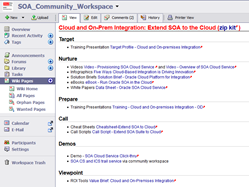 At our SOA Community Workspace (SOA Community membership required) you can find a complete kit for your event including ppt material and demos: SOA Suite 12c kit & BPM Suite 12c ppt kit. The pace of change, and the need to modernize IT and simultaneously deliver business innovations such as Social, Mobile and Cloud is stressing enterprise operating models as never before. To be sure, success in both is an imperative in today’s dynamic business environment. However, traditional packaged enterprise applications such as ERP can no longer deliver upon the wide range of opportunities and challenges facing IT Leaders. But for most enterprises, outright replacement is impossible. A new approach to enterprise systems is needed, one that leverages existing investments, while layering new capabilities around them within an open, flexible and secure architecture.